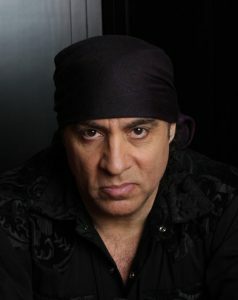 Steven Van Zandt is a musician, performer, songwriter, arranger, music producer, TV producer, actor, director, Broadway producer, activist and education advocate. And on Tuesday Oct., 23, the internationally known musician, a member of the Rock and Roll Hall of Fame and the New Jersey Hall of Fame, will serve as keynote speaker at the NJSBA/NJASA/NJASBO Workshop Conference 2018. Van Zandt, whose songs have been performed by artists such as Jackson Browne, Pearl Jam, Jimmy Cliff, Damian Marley, Margo Price, Gary U.S. Bonds, Darlene Love, Nancy Sinatra, Brian Setzer and Black Uhuru, will address the Workshop crowd on Tuesday, Oct. 23 at 2 p.m. in the Exhibit Floor Theater. The Workshop conference, the state’s largest training event for school leaders, will take place at the Atlantic City Convention Center from Monday through Thursday, Oct. 22-25. Commitment to Education Van Zandt, who co-produced the seminal Bruce Springsteen and the E Street Band albums “The River,” and “Born in the U.S.A.,” as well as a multitude of albums for other artists, and who starred in all seven seasons of HBO’s “The Sopranos,” has also made a commitment to furthering arts education. His band, Little Steven and the Disciples of Soul, are currently on the road with their Soulfire TeachRock Teacher Appreciation Tour. The landmark live tour will benefit The Rock and Roll Forever Foundation’s TeachRock program. Established by Dr. Van Zandt (he gave the commencement speech to the Rutgers University Class of 2017 and received an honorary Doctorate of Fine Arts), the foundation creates education materials that use the history of popular music to create engaging, multicultural lesson plans for history, social studies, language arts, music, and science classrooms, all of which are available to educators at no cost. “Music will forever be humanity’s most effective and consistent source of inspiration and motivation, and, we have learned, music turns out to be our most solid common ground for establishing communication between teachers and students, which is where education begins,” Van Zandt said. Springsteen Weighs In When Van Zandt was inducted into the NJ Hall of Fame, fellow musician Bruce Springsteen lauded Van Zandt and his work in education. TeachRock Resources The resources at teachrock.org are created with partners HBO, PBS, ABC News, and in collaboration with award-winning documentaries such as The Beatles: 8 Days a Week; Sonic Highways; RUMBLE: The Indians Who Rocked the World; and PBS Soundbreaking. The curriculum is endorsed by the National Councils for Social Studies, Geographic Education, and Music Education, and is an official component of the New Jersey School Board Association’s STEAM education program. The Soulfire TeachRock Teacher Appreciation Tour marks the first rock tour specifically geared towards addressing this crucial societal need. At each stop of the tour, The Rock and Roll Forever Foundation is hosting free TeachRock Professional Development Workshops, with educators who attend also receiving a complimentary ticket to that evening’s concert. Van Zandt has also done arts education work in Europe. The Notodden Blues Festival in Norway named its education project “Little Steven’s Blues School,” and TeachRock has contributed the curriculum. He has taught two master classes at the festival; taught master classes at the Oslo Music School and on “The Role of the Arranger” and “The 5 Crafts of Rock and Roll” for E Music; as well as teaching a master class on acting at the Lillehammer Film School. Van Zandt and his wife Maureen are members of the Count Basie Theatre’s board of trustees and directors, and helped the Red Bank theater develop an arts center that includes music, theater, and dance education. He also starred in, co-wrote, executive produced, provided the music supervision and scoring, and directed (the final episode) for the award winning series “Lilyhammer,” which was the first original programming for Netflix. And in 2001, he launched “Little Steven’s Underground Garage,” his internationally-syndicated radio show and the most successful syndicated rock music radio show in the past 40 years. Van Zandt also created and produces the first two channels of original content on SiriusXM Satellite Radio, the Underground Garage (Channel 21) and Outlaw Country (Channel 60). In 2006 he launched his record label, Wicked Cool Records, to further support new rock and roll. More Information To learn more about Workshop 2018, visit workshop.njsba.org.